It was a lovely fall day in Maryland. A perfect day for a lunar transit! Here's an AIA 171 Å image showing the Moon blocking a slice of the Sun. The wobbling images tell us that another round of calibration maneuvers has started. Today we have the EVE Field of View and AIA/HMI flatfield maneuvers from 1315-1910 UTC (9:15 a.m.-3:10 p.m. ET). Next Wednesday SDO will perform the EVE cruciform. 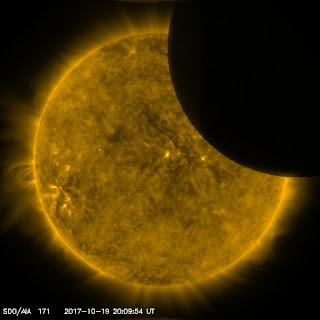 On October 19 we will have another lunar transit. A little deeper than the one on August 21, but still not a total eclipse. Here is the movie showing what it will look like.